3.14 – August and Everything After @ Venkman’s! 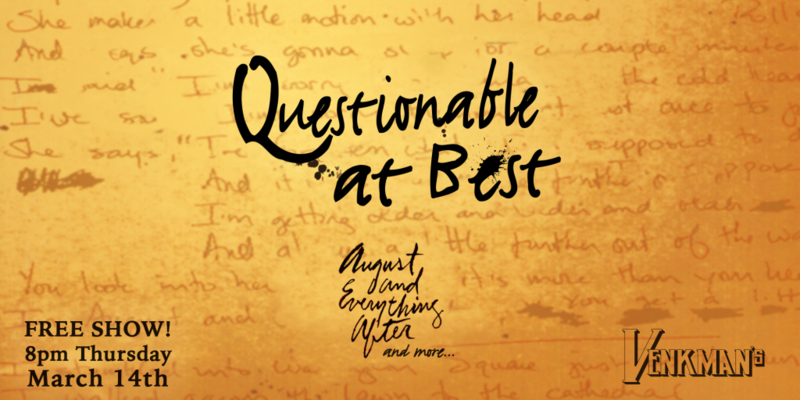 Questionable at Best will perform Counting Crows’ debut album, “August and Everything After” in its entirety, plus some other Q@B favorites at Venkman’s on Thursday, March 14th, 2019. This is a free show. See you there! Questionable At Best: Unquestionable music at its best. Hello, we are Questionable At Best and we like to make the music. We will not be content until you and your party have thrown your hands in the air, and are at least considering waving them like you just don’t care. Our name may be questionable, but our rock is undeniable. ERROR: Error validating access token: Session has expired on Monday, 04-Mar-19 12:44:24 PST. The current time is Thursday, 18-Apr-19 05:59:54 PDT.